Motorized pipette controllers are essential these days in any lab that uses serological pipettes. The older 3-valve pipette fillers and pipette bulbs hold value in their simplicity. However, newer motorized pipette controller technology provides a myriad of benefits for labs that were not previously available. Ergonomic motorized pipette controllers will save time in the lab and reduce fatigue for the user. Motorized pipette controllers are a great way to pipette large volumes of solutions in an efficient manner. Below we will discuss some of the best motorized pipette controllers on the market today. 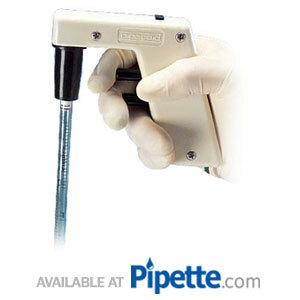 The Drummond Pipet-Aid is the world’s first motorized pipette controller. It was created and developed by Drummond Scientific as an alternative to mouth pipetting. A patented, easy-to-use volume control mechanism permits precise fluid intake and delivery. A check valve protects against accidental fluid intake into the handle and the optional Tissue Culture Nosepiece will prevent cross-contamination due to over-pipetting. A special filtration unit for use with biohazardous materials is also available. With a unique, ergonomic design built for hours of comfortable, single hand operation, the Drummond Pipet-Aid reduces stress from pipetting on your arm and forearm. This pipette controller was introduced in 1972 and single-handedly changed laboratory pipetting applications forever. Now, Drummond is synonymous with the terms pipet aid, controller, pipet aid filters and microdispensor. Durability and leading-class quality are two characteristics of the Drummond Scientific product line. This reputation for excellence and reliability is one of the reasons Drummond Pipet-Aid is such a trusted product in laboratories all over the world. The foundation of the product line’s success is the wide-range of needs it now serves. The leading advantage of choosing the Pipet-Aid product is that it can be used with glass or plastic pipettes. This flexibility means that the product is now the trusted standard for pipetting applications across the industry. It has now become the leading product ahead of mouth pipetting solutions, and has led to the development of a full Pipet-Aid suite that helps meet a host of demands within a laboratory setting. For example, those working with specific deadlines as part of their testing within a lab environment might consider the XL model, which features a quiet, more efficient pump that has been designed to extend the operational period between system charges. The round shape, balanced weight Motorized Pipette Controller, and light action spring buttons reduce fatigue and increase accuracy. 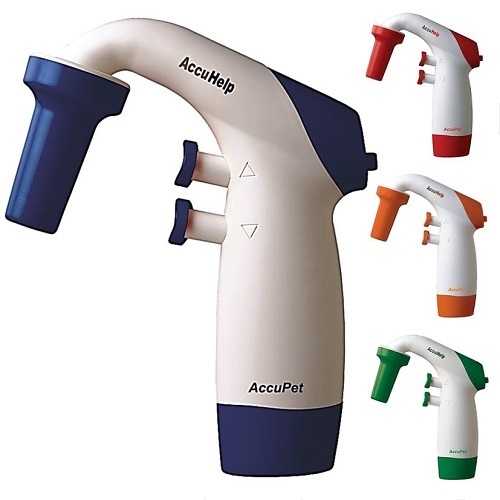 AccuHelp is compatible with glass or plastic pipettes, ranging from 1 to 100mL and is available in four different colors. Flexible. Can be used with all types of serological and volumetric pipettes from volumes of 0.1-100 mL. Fatigue-free pipetting. Weighing an impressive 160 grams, it is lightweight, well balanced and sits comfortably in your hand. Smooth pipetting. Smooth pump speed for greater meniscus control. Long battery life. The Lithium-polymer battery allows for long pipetting sessions without the need to recharge (6 hours of use for 3 hours of charge time). Multitask while charging. 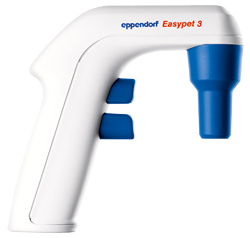 You may use the Eppendorf Easypet during recharging. Eliminates corrosion. Pressure equalization system releases aspirated vapors before entering the Easypet 3 to help eliminate corrosion. RFID chip. The Eppendorf Easypet is equipped with a RFID chip and Eppendorf TrackIT system to easily track and document your information.